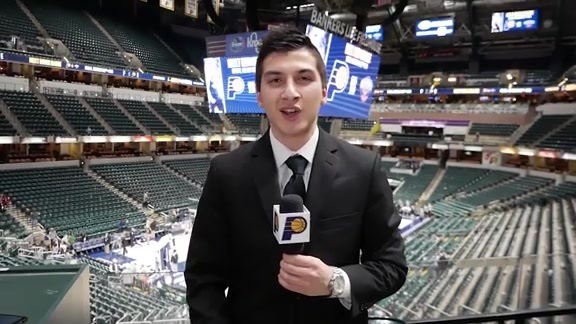 February 13, 2019 - Pacers.com's Zain Pyarali breaks down the Pacers' first loss in the month of February as they head into the All-Star break with a 38-20 record, which is good enough for third place in the Eastern Conference. 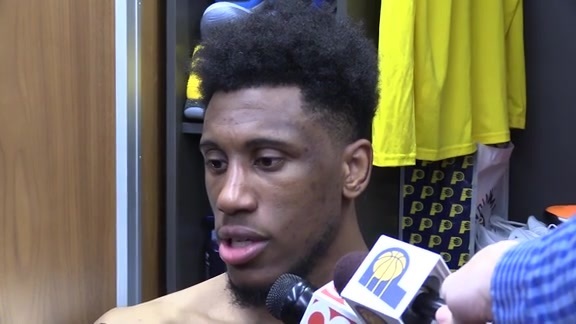 February 13, 2019 - Pacers players Thaddeus Young, Myles Turner, and Darren Collison discussed Indiana's 106-97 loss to the Milwaukee Bucks on Wednesday night at Bankers Life Fieldhouse. 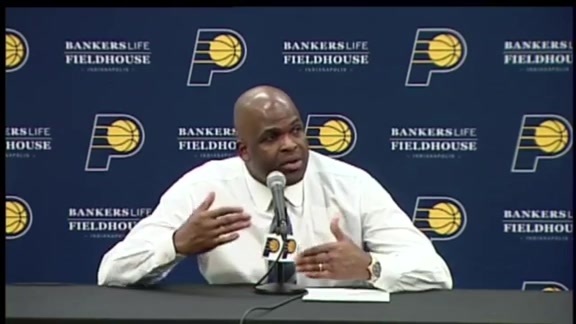 Feb. 13, 2019 - Pacers head coach Nate McMillan speaks with the media following Indiana's 106-97 loss to the Milwaukee Bucks at Bankers Life Fieldhouse. February 13, 2019: Tyreke Evans keeps the ball on a string and hits the 3-pointer off the dribble. 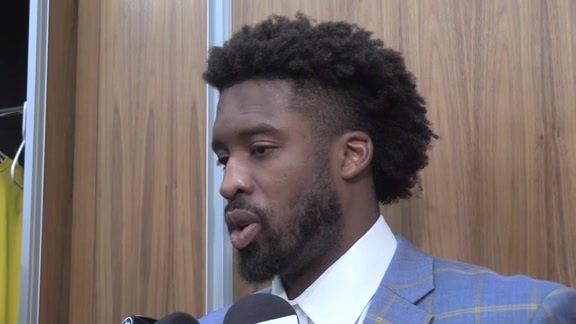 February 13, 2019: The Pacers scramble for the defensive rebound and get the ball up the floor to Wesley Matthews, who calmly hits the three to give the Pacers the lead. February 13, 2019: Bojan Bogdanovic gets the ball on the fastbreak, steps back and hits the three. February 13, 2019: Bojan Bogdanovic grabs the jump ball and goes coast to coast for the tough layup. February 13, 2019: Domantas Sabonis catches the pass and immediately spins to his left for the layup down low. February 13, 2019: Darren Collison drains the corner 3-pointer after some nice ball movement. February 13, 2019: Domantas Sabonis hustles for the offensive rebound and kicks it out to Tyreke Evans for three. February 13, 2019: Domantas Sabonis finds Cory Joseph with a nice behind-the-back pass and Joseph finishes. It was an easy game to hype, coming as it did on the heels of a six-game winning streak against a conference opponent with the NBA's best record. Was it a semester exam? A litmus test? Foreboding? Nate McMillan didn't see it that way. Speaking before the Pacers' played Milwaukee at Bankers Life Fieldhouse on Wednesday, he refused to buy into its playoff implications. "It's a game," he said. "It's a big game in the sense it's on our home floor and you've got a hot team coming in here. Whatever happens after this we'll have the same approach next Friday. Try to get better." The Pacers displayed that need to get better in their 106-97 loss to the Bucks, a game in which they trailed by 13 points in the first half, led by 10 in the fourth quarter, and lost by nine because they stumbled on their path to the finish line. They'll resume play after the All-Star break against New Orleans a week from Friday and then head toward a challenging March schedule that will provide a better indication of where they rank among their peers. Their 38-20 record at the break should disappoint nobody, even in the wake of Wednesday's disappointing outcome. They'll return from the break in third place in the Eastern Conference and go to work on hanging on to a top four position that brings homecourt advantage in the first round of the playoffs. Milwaukee, which improved to 43-14, provided a hint of what's to come. "I told our guys, tonight really starts what we'll see from here on out," McMillan said. "We'll see more playoff teams down the stretch, and in this atmosphere. Get away, get your mind off of basketball, because we're going to need the focus and energy that we've been talking about playing with to finish our season." The Pacers' first six games following the break will be forgiving, as all come against teams that currently have losing records. Then their road turns into a steep climb. Ten of the following 11 games will be played against teams with winning records as of now, starting with a March 7 game at Milwaukee. Of those 10, eight will be played on the road. The one certainty that came out of Wednesday's game, the one issue that will have to be resolved before they begin that hellish trek, will be closing games against elite opponents. 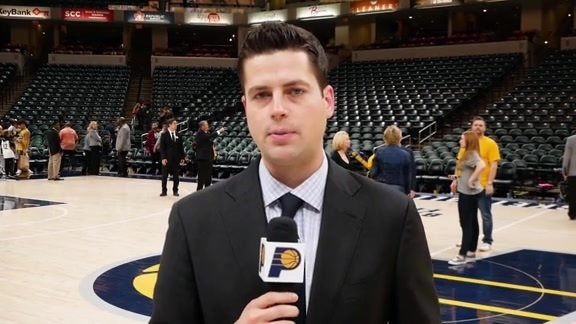 The Pacers have generally done that well dating back to last season, and were 33-1 heading into Wednesday in games they led by 10 points or more this season. They had reasonable hope of improving that mark after Tyreke Evans' step-back 3-pointer opened an 86-76 lead and forced a Milwaukee timeout with 9:37 left, but that turned out to be their peak moment. Bucks coach Mike Budenholzer went with a big lineup most of the rest of the way that included 6-10 forward Ersan Ilyasova in place of point guard Eric Bledsoe. The Pacers took their last lead on Thaddeus Young's 3-pointer with 4:42 left, but were outscored 13-2 after that. 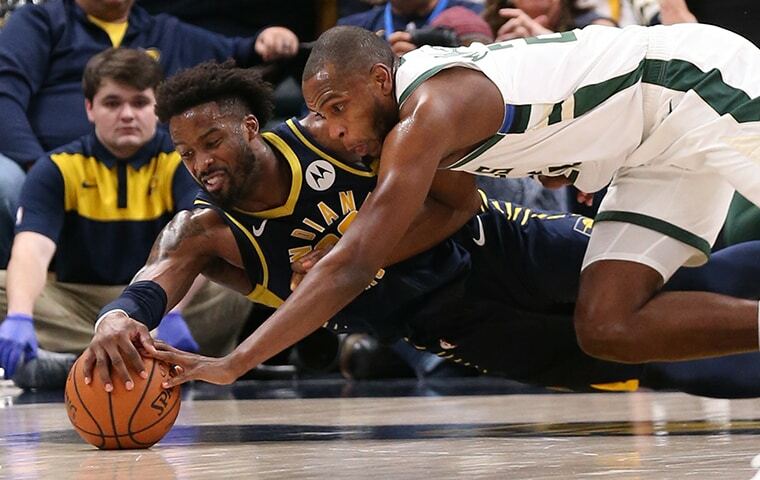 Milwaukee began switching on defense and the Pacers missed six of their final seven attempts and committed two turnovers down the stretch. 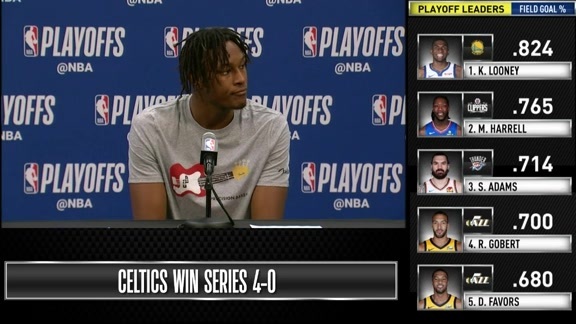 "It was bad execution on our part," said Myles Turner, who was limited to 11 points on 4-of-13 shooting. "We got away from what got us the lead in the first place." Namely, moving the ball. The Pacers had outscored Milwaukee 32-21 in the third quarter by picking up the pace at both ends. Eight of their 12 field goals in the period were assisted, and they limited the Bucks to 7-of-22 shooting. That all flipped when it counted most. The Pacers hit just 8-of-22 shots in the fourth period because most of them were a little rushed or off-balance. 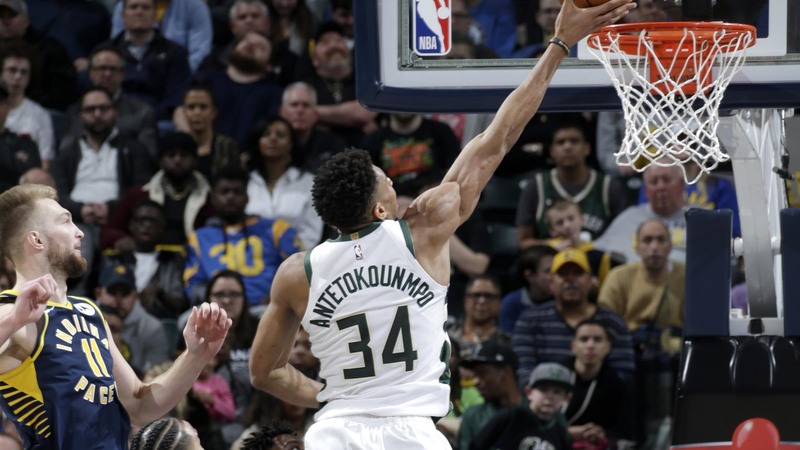 Giannis Antetokounmpo, meanwhile, asserted himself by scoring 12 points in the final period to finish with 33 points, 19 rebounds, and 11 assists. "We weren't able to make the right reads," said Darren Collison, who scored nine of his 14 points in the third quarter but failed to score or pick up an assist in his six fourth-quarter minutes. "We've been pretty successful on switches, but the last five minutes didn't go our way." The Pacers' greatest hope for improvement over their final 24 games lies with new acquisition Wesley Matthews. After starting 44 games for Dallas, he was sent to New York before the trade deadline. He started two games for the Knicks, hitting 4-of-19 shots, and then signed with the Pacers on Sunday. He's hit 4-of-17 shots in his two games for them, and the uncertainty shows in his game. But so does the blue collar approach that keeps him diving on the floor for loose balls and playing aggressive defense. He has a career scoring average of nearly 14 points while hitting 38 percent of his 3-pointers. Plug those numbers into the Pacers' starting lineup and their odds of contending with the likes of Milwaukee improve dramatically. "I know this team is capable of hanging with teams like that," Turner said. "I don't take away too much from this game. We've just got to be able to finish the game." They'll need to have it figured out by March 7.